1UP's Bob Mackey just posted a great little write-up dedicated to one of my favorite gaming mascots: Bonk. In the post, Mackey writes, "what made the Bonk series so appealing to me originally was its colorfulness... [It] had this vibe of vibrant cartooniness you really couldn't find in many other console games. In comparison, Mario and Sonic were downright warm and gentle in their fluffy, pastel-colored worlds--Bonk's bold colors and endearingly ugly characters had more in common with something out of The Simpsons than the relative lushness of Nintendo and Sega's offerings." I wholeheartedly agree. Don't get me wrong, I love me some Mario--Sonic, not so much--but Bonk brought something different to the table when his first game was released back in the early 90s, and whatever that something was I ate up like it was a hot fudge sundae. Sadly, the series seemed to lose steam after Bonk's Revenge. (In my humble opinion, of course.) 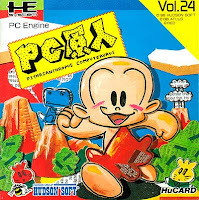 Bonk 3 just wasn't as compelling as its predecessors, and the Super Bonk games released on the Super Famicom/SNES lacked a certain spirit as well. I doubt that trend will be broken by the upcoming PSN/XBLA/WiiWare sequel, Bonk: Brink of Extinction, but I'm willing to give it the benefit of the doubt until I actually spend some quality time with it. The ability to climb up waterfalls with my teeth hooked me. I bought Bonk on the VC, but I got stuck. Literally, stuck. There was a jump I wasn't able to make, and when I fell back down the flower I was supposed to pogo off of was gone. So...I quit. Might I ask why you don't like Sonic? I'm not really fond of Sega's Blue Blur either, but I've never really been able to put my finger on what it is that disagrees with me until recently. I just wondered if it was the same with you. Did you buy Bonk 1 or Bonk 2, Justin? I ask because I think Bonk 2 is the better game, though Bonk 1 has its charms, too. Sorry to hear you got stuck, though. That's never happened to me! Do you think it was some kind of glitch? As for Sonic, I don't mind the character himself and I actually find him appealing enough, but I've never been able to get into the games in which he appears. I've tried all of the Genesis games and I even tried the first one on the Dreamcast, but they just didn't hook me. It's probably for the best, considering how far the series has fallen since that first Dreamcast outing. I just was curious. I feel like the premise of the Sonic games is a little broken. The levels encourage you to go fast. The character is built for speed. But the game punishes you for going too fast, blindsiding you with enemies and pitfalls. It's just...a little broken.